The Painting Center is pleased to present Signals that Gather. Signals that Gather examines the legacy of Modern/Postmodern abstraction in the work of four artists: George Schroeder, Nancy Seibert, Bridget O’Donnell, and Jack McWhorter. The artists represent three generations with a combined art experience ranging from Modernism, embracing essential qualities of color and flatness to Postmodernism, a paradigm shift opening the door to a pluralism of form, technique and reference. The works in this exhibition range from simple impulses and then build towards pictures that express thoughts, feelings and invisible forces. In keeping with the legacy of abstraction these artists are interested in realizing their creative intentions through the elements of painting - shape, color, line, and what they can do to imply movement, balance, pressure, rhythm- to be fully expressive without overt subject or narrative. The simplification or abréviation of source images allows for visual inconsistencies to emerge. It is these discrepancies that engage and connect this group of artists and is their entry point into abstraction. A series of related signs or signals disperses over the surface of the canvas and marks off certain distances toward a resolution of different types of visual information intersected by color. Additionally, these artists share an interest in how the properties of oil, acrylic, latex and mediums transform and reinvent their source material. Every pigment is a chemical and triggers a chemical response. Things happen in George Schroeder’s paintings. They speak. Or keep their secrets. Are they generous revelations of knowable, familiar things, or silent witnesses to mysteries? That would largely depend upon viewers’ expectations, focus and intentionality in assessing the elegant geometric abstractions that Schroeder offers. His “lines” can just as well be read as juxtaposed planes, in high contrast, that interact in a variety of ways. These interactions – intuitive decisions on the artist’s part, imbue the paintings with a formal intelligence that balances rhythmic movement with stillness. Amid all the precision of flat, hard-edged geometric design there is also a richly subtle and playful spatial balancing – a gentle pushing and pulling between positive and negative planes. Nancy Seibert draws her pictorial inspiration from the atmospheric and earthy nuances of summer and autumn, but because the works are manifestations of the power of the artist’s intuition in generating her ethereal visions. These paintings, while suggesting seasonal light, color, and airy motion (without being literal illustrations), are also intriguing, visceral evidence of an ephemeral, abstract process. Most of that evidence rises from variable paint viscosities and textures, combined with real sensitivity to gestural brush marks. Yet for all of the apparent hand manipulation of her materials, the resulting imagery looks more spontaneous than self-conscious, as if a passing gust of wind or an ocean wave deposited these configurations on to their surfaces. 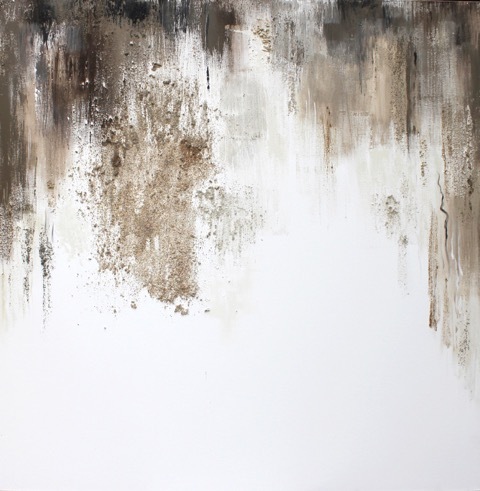 So Seibert’s technique has allowed her to frame essences, imbuing her surfaces with a sense of transient physicality. These are translations of immanent, changeable weather, and otherwise elegant impressions of both celestial and earthen flux. Collectively, Bridget O’Donnell’s mixed media work seem to comprise an urgent journaling of states of mind and heart, as if to record memories before they fade and disintegrate completely. Fragments of textures, patterns, colliding irregular shapes and voids are interspersed with musical staffs, clefs and floated words and phrases: “disjoined; dislodged; I’ve grown tired; you don’t mean it; tried to tell you; ain’t nobody listenin”. The images are more than simply directionless doodles and nihilistic notes. Their small scale keeps their big ideas from being too chaotic or overwhelming. And for all of their stark black-and-whiteness, they nonetheless invite closer scrutiny of their intense visual rhythms. In their often uneasy equilibrium between empty shapes, areas of changing tonality, and smaller concentrations of linear scribbling – things crossed out or partially erased – they suggest more about disruption - psychological, emotional and/or spiritual - than outright destruction. Jack McWhorter continues to explore the confluence of art and science – a formalization of intuition. The push-and-pull dynamic between organic and geometric shapes and structures still constitutes his visual syntax. And the paintings continue to evoke cosmological and/or biological diagrams, models, or paradigms that scientists use to delineate the workings of esoteric physical phenomena and ephemeral forces in flux. McWhorter does not try to illustrate scientific concepts but rather is thinking about the beginnings of complex spaces. Yet these recent works are invested with a distinctly more intensified painterly liveliness than in the past. Even when a layer of paint gets scraped away or thinned, the overall character of the mark-making exudes a rigorous confidence. Coupled with a brighter, more elevated palette, many of these newer pieces pulse, seethe and crackle with what can only be called jubilant energy in the way they describe excited interactions of rhythm, pattern and motion – systems or processes simultaneously matured and nascent, static and morphing.